The Center for Research in Computing and the Arts (CRCA) is an interdisciplinary Organized Research Unit of UCSD that facilitates the creation of vanguard culture through artistic, scholarly, and technological research. As the University of Californiaâ€™s oldest arts research center, CRCA celebrates its continuing legacy of almost 40 years of leading edge research by presenting a new series, the CRCA Exchange, in conjunction with Calit2 and the UCSD 50th Anniversary. 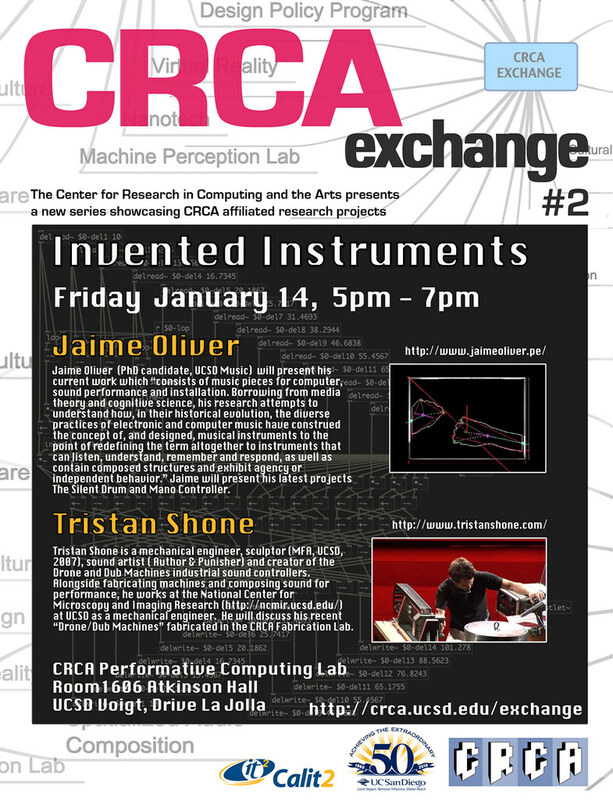 Jaime Oliver (PhD candidate, UCSD Music) will present his current work which “consists of music pieces for computer, sound performance and installation. Borrowing from media theory and cognitive science, his research attempts to understand how, in their historical evolution, the diverse practices of electronic and computer music have construed the concept of, and designed, musical instruments to the point of redefining the term altogether to instruments that can listen, understand, remember and respond, as well as contain composed structures and exhibit agency or independent behavior.” Jaime will present his latest projects The Silent Drum and Mano Controller. Tristan Shone is a mechanical engineer, sculptor (MFA, UCSD, 2007), sound artist (Author & Punisher) and creator of the Drone and Dub Machines industrial sound controllers. Alongside fabricating machines and composing sound for performance, he works at the National Center for Microscopy and Imaging Research (http://ncmir.ucsd.edu/) at UCSD as a mechanical engineer. He will discuss his recent “Drone/Dub Machines” fabricated in the CRCA Fabrication Lab.